Adelaide, Australia (AP) — Mitchell Starc struck with his fifth ball and returned to get the biggest wicket under lights, giving Australia a psychological edge over South Africa when he ended Faf du Plessis’ impregnable run at the Adelaide Oval. Nathan Lyon chimed in with three wickets — including two in the last three overs — as South Africa slid to the end of the third day of the third test at 194-6, a lead of 70 against an Australian XI containing five changes since they surrendered the series in a heavy defeat in Hobart. Stephen Cook was holding the South African second innings together in his sixth test with an unbeaten 81 from 199 balls, only able to watch as Temba Bavuma (21) and night-watchman Kyle Abbott (0) succumbed late to Lyon’s offspin. “We want to come out and prove to Australia that cricket is in good hands,” Lyon said. “South Africa have outplayed us in the last two test matches, but we feel like we’ve bounced back well so far. South Africa’s batting coach, Neil McKenzie, was confident Cook and Quinton de Kock could help give the tourists a big enough lead to defend. De Kock has scored a century and two half centuries in the series and has dug South Africa out of trouble twice. “We’ve won the big battles the last two test matches (and) there’s another opportunity for us tomorrow for us to capitalize on a big partnership,” McKenzie said. “There’s a lot of faith in the dressing room with the guys still coming in. Ten wickets fell Saturday after Australia resumed at 307-6, starting with Usman Khawaja’s dismissal for 145 — the first century of the series for the hosts. 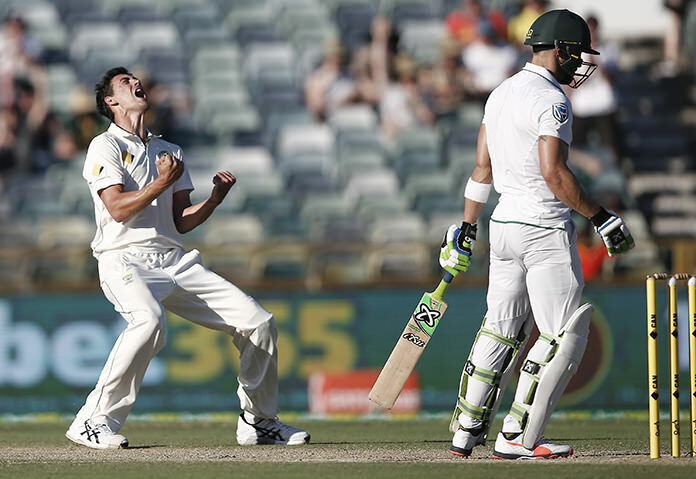 Starc contributed 53 in a lower-order cameo before the Australians were all out for 383, a 124-run first-innings lead. Then, with the ball in his hand, Starc had the South Africans in trouble when he had Elgar (0) well caught by Steve Smith at slip with the total at one. He had a chance put down off Hashim Amla when the veteran South African was on 13, but rookie Matt Renshaw failed to grip an edge that flew into the corridor between slip and wicketkeeper. Amla went on the attack and appeared to be racing toward a 32nd test half century before he fell to Josh Hazlewood for 45, and South Africa slipped to 82-2. J.P. Duminy never settled before he was bowled by Lyon in the 49th over, bringing du Plessis to the crease to a chorus of boos. In his test debut at the Adelaide Oval in 2012, du Plessis salvaged a draw for South Africa when he faced 376 balls in an unbeaten 110 on the last day, swinging the momentum of that series. With this series already secured after wins in Perth and Hobart, du Plessis scored another unbeaten century on Thursday, his 118 from 164 balls accounting for the bulk of South Africa’s 259-9 before he made a tactical declaration late on the first day. The South Africa captain was full of confidence, and his team needed him to bat through the night session against the pink ball. But his unbeaten run of 565 balls — spanning three innings — ended when he was out for 12, caught in the gully as he drove at a full ball from Starc. The situation deteriorated from there for the South Africans, with Lyon dismissing an impatient Bavuma before trapping Abbott lbw three balls from stumps.